Don't worry, everyone has them, but thankfully JoJo is here to save the day. She'll whip you up a power ponytail before you can say "hair bow." She's known for her bright, colorful, and loud style and now you can have it with this funky kit. Put your hair up into a pony then sing into your hairbrush. Pretend you're JoJo herself! Lip-sync (or actually sing) to Jo-Jo jams like "Boomerang," "Hold the Drama," and "Kid In A Candy Store." Who knows, you could be the next JoJo in-the-making. 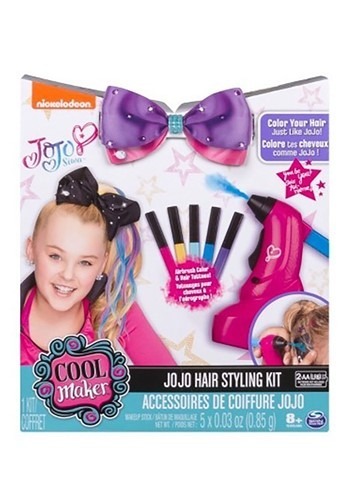 This kit will definitely give you her unique aesthetic. Pick up an officially licensed JoJo costume (sold here) for a more immersive creative experience!